As people continue to explore natural health alternatives, they question if artificial sweeteners are a safe alternative to sugar. And people looking to lose weight and lower their sugar intake are particularly cautious about the use of sweeteners. Excessive sugar and a high-calorie intake can lead to health conditions such as diabetes and heart disease. Get the straight skinny on alternative sweeteners and how to make smart choices. A total of five artificial sweeteners are approved by the United States Food and Drug Administration (FDA). These sweeteners include sucralose, neotame, saccharin, acesulfame, and aspartame. In addition, one low-calorie sweetener is FDA-approved – stevia. There are also calorie-free sugar alcohols added to processed foods by industrial producers. Most artificial sweeteners contain zero to four calories, which is much less than sugar. All of these sweeteners are made differently. And the human brain and body respond to them in a complex way. Sugars are naturally part of many healthy foods, such as fruit. And these sugars tend to be acceptable. Refined sugars and high fructose corn syrup are added to many of the sweet treats people crave, such as cookies, cake, and candy. And these sugars are typically the culprits when it comes to weight gain and health issues. So it matters which type of sugars people consume. There are also natural sugars, such as agave and honey. Both of these also become fructose and glucose in your body. And tooth decay is another problem associated with the consumption of sugars. Healthy lifestyles go beyond the type of sweetener people use. The mindset also matters. For example, people might choose a diet soda so they can have a piece of chocolate cake. In this situation, it makes no sense to use a sugar substitute to substantiate eating more. And research revealed certain artificial sweeteners could be addictive. According to a recent study, rats exposed to cocaine were then given a choice between saccharin and intravenous cocaine. Most of these test subjects chose saccharin. Plus, artificial sweeteners are hundreds of times sweeter than sugar, so people continue to crave excessive sweetness. Natural foods have a wide range of flavors, from bitter to sour and sweet. In contrast, a vast majority of processed foods are sweetened with high fructose corn syrup. Not only does the sweetener contain high levels of fructose, but the corn used to make the syrup is heavily sprayed with the herbicide glyphosate. While the EPA maintains that it is safe, glyphosate has been linked to the rise of various chronic diseases, including autism, according to MIT researcher Stephanie Seneff. Additionally, a number of countries have banned or are seeking to ban its use on there crops. Another factor is the choices people make. When people are trying to lose weight or reduce risks associated with a health condition, well-balanced meals are the best option. And foods with artificial sweeteners might make people feel is it “okay” to grab processed, sweet treats. As a result, they are still not eating the foods that provide the natural energy and nutrients needed for good health. Another study showed drinking diet drinks was associated with a 67% increased risk for type 2 diabetes. And because of chemical processing, the continued use of artificial sweeteners may be linked to cancer. So research is starting to show artificial sweeteners might not be offering the benefits people think. Artificial Sweeteners and Your Gut Microbiome – What About Your Gut Health? Our genes and gut microbiomes affect our ability to properly digest foods and extract the necessary energy from consuming them. 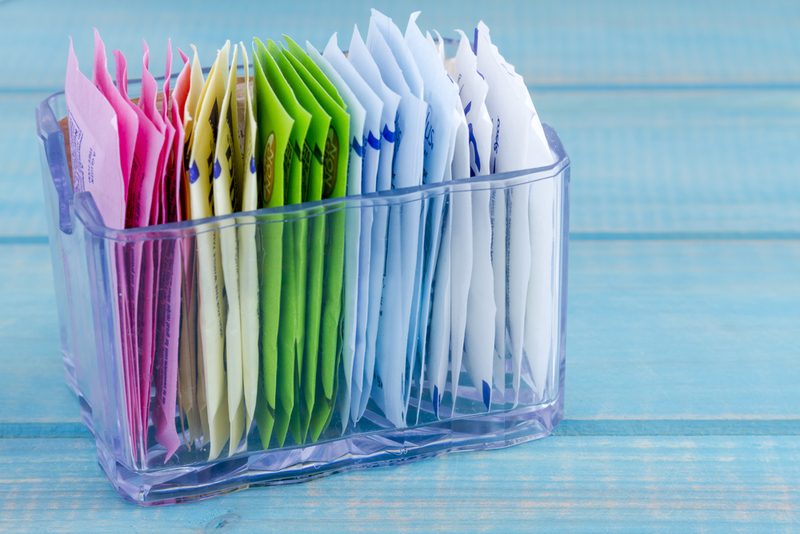 Studies have shown artificial sweeteners can have a negative impact on your gut bacteria. As a result, conditions such as obesity and diabetes may develop due to raised blood sugar levels. And this is exactly what people want to avoid when they choose artificial sweeteners. A healthy gut contributes to our overall well-being. And sugar has also been linked to having a poor impact on gut bacteria. There is no substitute for healthy eating when it comes to gut health and reducing the risk of conditions such as diabetes, obesity, and heart disease. People craving a sweet treat should reach for a piece of fruit or a small square of dark chocolate, which contains antioxidants. Moderation is crucial when it comes to the use of artificial sweeteners and sugar. And the goal is to eliminate them from your daily diet and get natural sugars from healthy foods instead. Do you have questions about gut health and choosing the right foods? Contact us to find out more about making the best choices.